Feels good to be back out on the Big Lake fishing! The boat is running good and the fish are biting. We fished north of Ludington the last two days and south the afternoon of the 23rd on our initial shakedown cruise. We set in south of the project on the 23rd in 12 feet of water (fow) and trolled south to just pass the Bass Lake outlet. 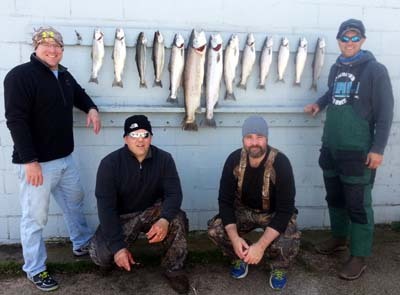 We had 4 bites and took 3 fish, 2 Kings and a Lake Trout. The Kings were good size for this time of year. The biggest one came on a Dreamweaver Super Slim Ice Breaker Spoon with a 50 ft. lead out 35 on a small Slide Diver. I lined up a crew yesterday to check out the north water. We set in 15 fow by Epworth and took it north working between 20 and 8 fow. We picked up 2 Browns by the Lincoln River and a couple more by the Bathhouse at the state park. The action really picked up when we got north of the Point. We continued north and pulled lines in the 06’s. Our hot rigs were a Rapala F11 Brown Trout on a clean bird and the Super Slim Ice Breaker spoon on our high Slide Diver. Our biggest fish was a Brown just shy of 15 lbs. caught on a Yeck 44 Gold Lighting spoon on a 1 color core. Today was our first charter in 2015. We ran north of the Point and set up in 17 fow and trolled north. We had good action most of the trip and had fun with our father & son crew. The big Lake Trout took a Dreamweaver Super Slim Gold Mixed Veggie on our low Slide Diver. The 2 Steelhead came on a Super Slim Green Dolphin on a 1 color core. We worked back and forth between the Point and the 06’s between 20 & 10 fow. 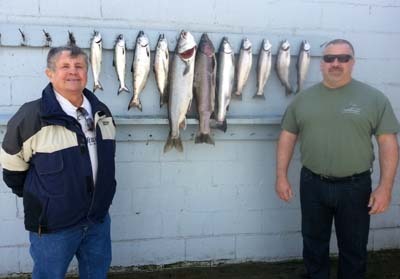 The fishing is good and we have lots of openings the rest of this month and early May.